We worry about minor things and big things, whilst the word is assuring us that the fields grow and produce harvest in set times and it’s not like they can work to make it grow itself, they aren’t humans but are taken care of by humans and these same humans - you and I shouldn’t need to worry about what we wear because God will never make us go without, but will always make sure we have in abundance and are taken care of. That is beyond satisfying and assuring and a truth we must all hold onto. So as hard as it may be take the step not let worry consume you any longer – pray and release all to God to help you. 29 yet Solomon in all his glory was not dressed as beautifully as they are. 30 And if God cares so wonderfully for wildflowers that are here today and thrown into the fire tomorrow, he will certainly care for you. Why do you have so little faith? God cares for us more than we could ever imagine and so when things try to consume us and shake our faith, we can have the tendency to forget all this and act out the worry in our actions and how we treat others. But when we worry for tomorrow and question His care and love we are also showing that we have little faith in Him to perform what He said He will do. 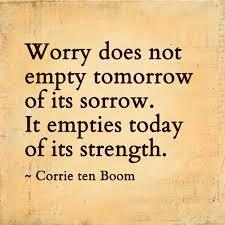 The word is saying to not worry about the external factors, but that God has it all under control. How beautiful it is to know that He assures us and also shows us the way to go. We have Him and unbelievers don’t, so when they complain and question life, we shouldn’t entertain that way of living too and questions things because of who our Heavenly Father is. To supply all our needs according to His riches in glory and the beauty is He knows it all, there is nothing hidden from Him. All that we need He provides. Unbelievers have negative thoughts and never ending questions and doubt in their circumstances, the moment we think and act like them we are doubting God and taking Him away from the circumstance and encouraging room to sin and do things the short cut way. The requirement is to seek the kingdom of God first and all other things that we need will be added unto us, He has us so we shouldn’t worry or question, let your faith rise up and all negative thoughts be scattered. We must follow this with faith and trusting that God has not left us, knows what we need and also says clearly what to seek, and that is not what the unbelievers seek. We should be able to put God first in all we do, in our thoughts, actions, character, day to day – in everything. Material things and people are all temporary and shouldn’t be made to be priority in our lives, we ought to put God first always and everything else secondary. We can plan things out and be productive, but then to worry and doubt is to waste precious, valuable time. But we shouldn’t be so consumed in planning to block out the worry, but should rather address it because then that becomes a problem and can interfere with you and God. Don’t let what you focus on and worry about for the next day; affect you in the moment with God. Embrace the moment and don’t rush ahead, He has you and knows what you need. - Live in the now and have faith for tomorrow, not worry.